The picture below shows a Handlebar Grips - Medium / Hard. Thousands of other top quality spares listed on our website at refreshingly low prices. 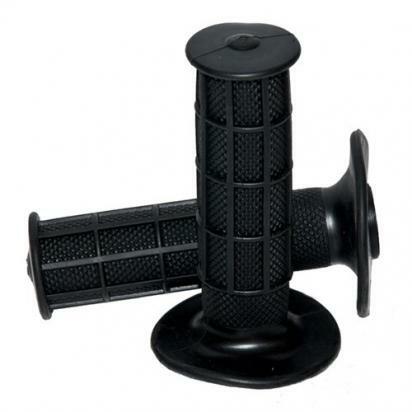 WRP high quality handlebar grips are ergonomically designed with a half-waffle pattern for a secure, non-slip grip. The special base-rubber compound is not only more durable than many other rubber grips on the market - it also absorbs vibration, so reduces fatigue and cramp. Half Waffle pattern on black WRP handlebar grips. WRP are an Italian company specialising in the development of on and off-road racing products. Only the finest quality products make it through WRP's intensive development programme with top-line sponsored racers and race teams. WRP's handlebar grips are used by German team, KTM Sarholz.